Charles W. Cain was an English painter, watercolourist and engraver. A student of Camberwell School of Art, Cain went on to be an illustrator and cartoonist for the Johannesburg Star until the start of WWI when he joined the Border Regt. in India. Cain became famous for his WWI drawings and at the end of the war the Imperial War Museum purchased thirty of his works. After the war Cain entered the Royal Colege of Art under Sir Frank Short (1920-21) and in 1921 Cain produced his first published engraving. 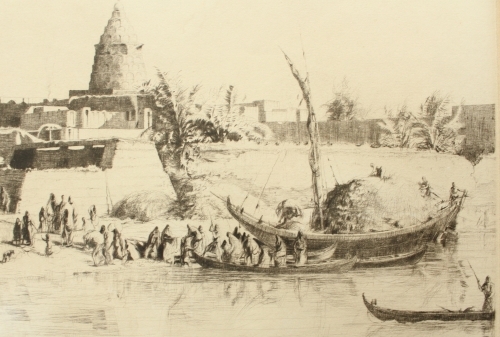 The large majority of his prints deal with scenes in Iraq, Persia, India and Burma.